Simply Delicious! 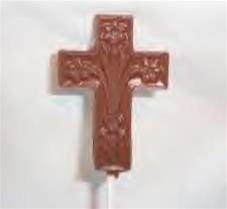 Our Chocolate Cross Lollipops are made of the finest chocolate. Creamy, smooth and decadent! So yummy your guests will be wanting more. Chocolate Lollipops are a perfect addition to your First Holy Communion, Confirmation, Baptism or Christening party. Each Chocolate Cross Lollipop comes is gold dusted to bring out the beautiful detail! Each Chocolate Pop comes in cellophane and curling ribbon. Beautiful colorful satin ribbon is also available, as well as Personalized Ribbon to make your Chocolate Cross Favors spectacular! You can choose from a personalized ribbon or satin ribbon for an additional charge. The curling ribbon is FREE!